Google+ is the fastest-growing social network in history, with 40 million users since its June launch. To help them focus, Google’s quietly shuttered a number of products, removing iGoogle and Google Reader’s social features and closing Google Labs, Buzz, Jaiku and Code Search in the last two weeks alone. But in doing so, they also killed off one of its oldest and most useful tools, from its most popular product. On Wednesday, Google retired a longer-standing “plus”: the + operator, a standard bit of syntax used to force words and phrases to appear in search results. The operator was part of Google since its launch in 1997 and built into every search engine since. Google wouldn’t disclose exactly why they phased it out, though it seems obvious that they’re paving the way for Google+ profile searches. When Google+ launched, instead of adopting Twitter’s @reply syntax, they coined their own format for mentioning people — adding a plus to the beginning of a name — triggering the future conflict with the + operator. The fate of the “+” symbol was clear: protect a 12-year-old convention loved by power users, or bring Google+ profile searching to the mainstream? It was doomed from the start. Geeks from Reddit and Hacker News were quick to condemn the move. To understand why they’re upset about a single character, let’s step back to Google’s launch in 1997. By comparison, the popular convention at the time was to return pages with any of the search terms present — an “or” search. The results were noisy and unhelpful. Google only supports “and” queries. That is, it only returns pages that include all the query terms. The + operator, which enforces “and” behavior on some search engines, is unnecessary on Google. At the time, this new feature was a godsend for savvy users. Because every term appeared in results, you could continue to refine your queries by simply adding new words to the search bar until you found what you were looking for. As Google grew in popularity, this didn’t scale. Non-technical users don’t know what search terms to use or how to use search modifiers, and they shouldn’t have to. Instead, Google needed to read minds to find what their mainstream audience was looking for, even if it meant ignoring what they actually wrote. They started with the introduction of spelling suggestions, with “do you mean?” prompts introduced in 2003. 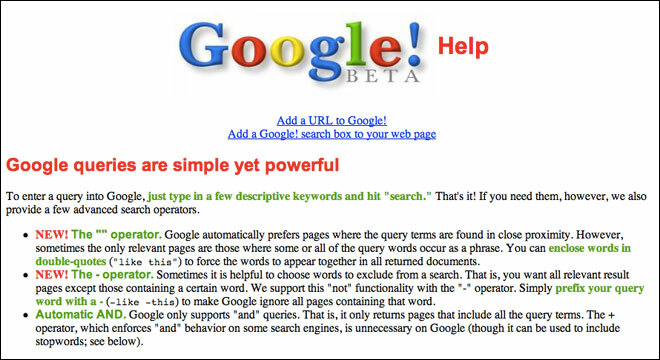 By 2009, these were so successful that Google replaced the user’s search with the corrected words by default, though they always explicitly explained the change. In January 2009, however, Google began experimenting with silently ignoring search terms completely. 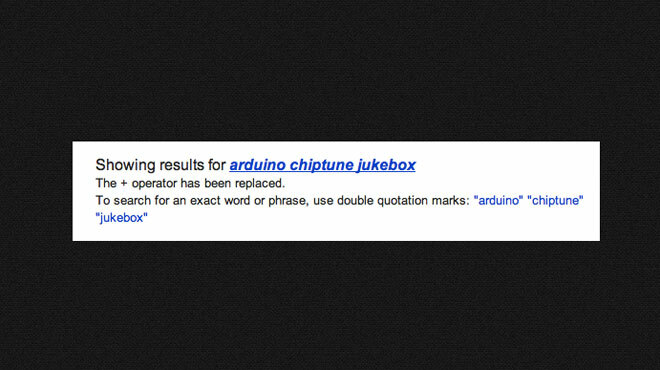 For anyone deep-diving Google for the dark corners of the Internet, this change was hard to swallow. For the first time, searches were unreliable — an “or” search instead of an “and” search. Journalists and software engineers, two classes of people who commonly search for obscure terms, objected to the change most. “I also use + constantly. It’s such a long-standing convention,” wrote Mat Honan, senior reporter for Gizmodo and former contributing editor to Wired. So, should we just “search” “like” “this” forever? Naturally, enterprising hackers are already routing around the perceived damage. As Google marginalizes its core base, it’s opened the door for smaller, more nimble startups, such as DuckDuckGo, a one-man project that’s quickly becoming the go-to search engine for discriminating nerds. With a corpus of powerful search modifiers and a hard-line stance against tracking and personalization, it was created and maintained for the last four years by a single engineer, Gabriel Weinberg. This month, Weinberg announced DuckDuckGo accepted funding from Union Square Ventures and hired his first full-time employee. For those unwilling to leave Google’s deep index, there are other solutions. One pseudonymous hacker made FindErr, a simple proxy that adds quotes to every search before shuttling the user off to Google. My personal favorite is this simple userscript created by electrotype for Hacker News, which instantly adds quote marks to every submitted search. It works in Chrome natively and Firefox with the Greasemonkey plugin. As a service grows in popularity, alpha users outlive their usefulness. The core users that helped build a service by word-of-mouth often find themselves dwarfed in numbers by people with very different needs. Take the recently-announced changes to Google Reader, for instance. Reader is the most widely used and deeply loved feed reader ever made, steamrolling over several startups in the mid-2000s in the process. Any startup would be thrilled to have their devoted audience; within Google, Reader seems like a distraction. Last week, the Reader team announced the removal of all of its social features, used by a relatively small but rabid fanbase. There’s no easy solution. Should a company be expected to maintain features indefinitely because a tiny fraction of their base loves them? There are tangible costs to maintaining old code, and fringe features can clutter an interface, making user experience worse for those that don’t use them. For those people, removing features is more than an inconvenience. It shatters an entire community. But, ultimately, their usage is a rounding error in the overall product activity. At Google’s scale, user testing can hide the behaviors and passions of entire subcommunities. The long-term implications of small changes like these are very hard to predict, especially with early adopters. Who knows? If Google’s search engine dominance started with an “and,” it might just end with a “+”.